This version is really exciting, since it provides a brand new UI theme: Hand Drawing. That means ForeUI can be used to create low fidelity wireframe now. What’s more, we can freely switch the fidelity of wireframe in ForeUI. Enhancement: Exporting the rumple effect to DHTML. Enhancement: Auto check new versions when startup. Fixed Bug_0063: The text label collapses spaces when simulating. Fixed Bug_0064: After dragging the opacity slider, too may opacity records in undo history. ForeUI V1.27 is released today! 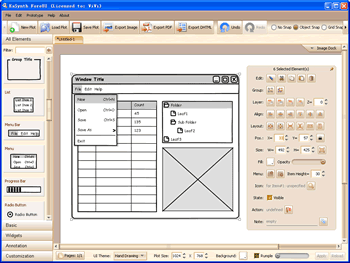 This version provides a new customized element named “Placeholder”. Placeholder is frequently used during UI prototyping, it can represent something that is not confirmed at this time, and help building the whole layout of the design. Bug_0057: Text label is on incorrect location during simulation. Bug_0058: The file “website_simulation.4ui” and “installer_simulation.4ui” can not be loaded at V1.25. Bug_0059: Too many css files are used, it will meet problem when simulating in IE. Bug_0061: The conditional loop is not really stopped when condition is not satisfied. Bug_0062: The text label ignore the line break when simulating. When we define the behavior of element, we can operate on selected element in the event handler. 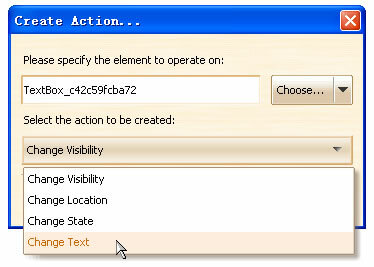 After we click the “Operate on Element…” menu item, we can create a new action that operate on selected element. We can click the “Browse…” button to choose the element to be operated on, but we can only pick one element at a time. What if we need to operate on multiple elements? Should we repeat creating actions for those elements? Can we work on multiple elements at a time? The first solution in my mind is to us the grouping, as we all know that in ForeUI we can group multiple elements as a group, which will be regarded as one element. So we can group multiple elements together and operate on the group. There is another workaround, some actions (such as change location, change visibility etc) provide the option to include other elements in the area. We can see element B and C are located within the area of element A, while element D is not in the area. When we create the action to hide element A and checked the “Include elements within the area” option, element A, B and C will all be hidden in simulation. What if we don’t have such kind of element like element A? There is an interesting skill: we can create a transparent element A (can be a rectangle element, without border, set its opacity to zero), and operate on the invisible element A. 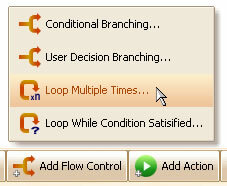 New Feature: Support loop in workflow simulation. 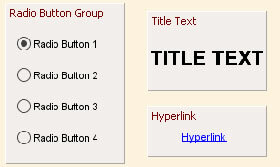 3 New Customized Elements: Hyperlink, Title Text and Radio Button Group. Enhancement: Simplify the action editing process. Fixed Bug_0052: Create customized element with a group, the behavior on members can not work (lost target). Fixed Bug_0054: Should show customized elements in “All Elements” category. Fixed Bug_0055: Inserted property should replace the current selection in expression. Fixed Bug_0056: Cancelling element selection should recover the previous selection. From now on, we can use loop in the workflow simulation. This feature is very useful when designing an interactive prototype. Now we have event handling, flow control (loop and branching) and actions, we can really make something that works on the web browser! Three new elements are added: Hyperlink, Title Text and Radio Button Group. Now we have put them together (see figure below), much more clear, isn’t it? Now the latest version can be downloaded here. You can also launch the online demo. Dynamically change the text of label supported. Now we can change the content of text label during the simulation. 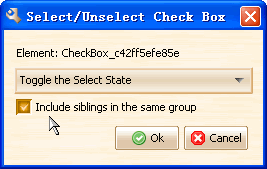 Allow setting select state of multiple check boxs within a group. We can put several check boxes into a group, thus we can set their select state with one action. Allow unselecting sibling radio buttons within a group when selecting on of them. We can also put several radio buttons into a group, thus we can uncheck other buttons when clicking on one button. [Bug_0048] Double click customized element to add, some elements are moved to incorrect location. [Bug_0049] Double click customized element to add, new elements should be selected. [Bug_0050] The color of text label should be changed when it is disabled. [Bug_0051] The action to change Text Edit Box value should support multiline editing.